Format: 61 Video Files (.mp4 format) + 2 PDF files. The UCSF Radiology Review – Comprehensive Imaging is appropriate for residents, clinical fellows and practicing radiologists interested in updating their working knowledge, by covering all the major radiology subspecialties. The course represents the breadth and depth of experience from each subspecialty while providing a step-by-step process for reaching a differential diagnosis. A comprehensive clinical update, this learn-at-your-own-pace course in radiology provides a maximum of 27.25 AMA PRA Category 1 Credits ™. Available online, it provides access to unbiased, evidence-based content and case-based reviews so you can expand your knowledge and incorporate the latest guidelines into your daily practice. UCSF designates this enduring material for a maximum of 27.25 AMA PRA Category 1 Credits ™. Physicians should claim only the credit commensurate with the extent of their participation in the activity. The total credits are inclusive of 9.5 in CT, 8.25 in MR, 5.0 in Ultrasound, 2.0 in Breast Imaging, and 1.0 in PET. 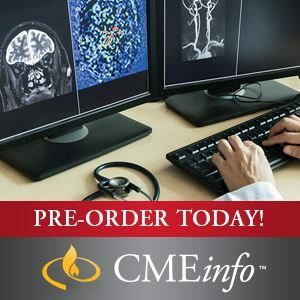 This comprehensive radiology overview is appropriate for residents, clinical fellows and practicing radiologists interested in updating their working knowledge, of all the major radiology subspecialties. The following speakers have disclosed a financial interest, arrangement or affiliation with the following commercial companies (which may provide products or services relating to his/her presentations). All potential conflicts of interest have been resolved in accordance with the ACCME Standards for Commercial Support. The following faculty have indicated they have no financial relationships to disclose: Spencer C, Behr, MD; Robert D. Boutin, MD; Soonmee Cha, MD; Jesse Courtier, MD; Brett M. Elicker, MD; Vickie A. Feldstein, MD; Nicholas Fidelman, MD; Ruth B. Goldstein, MD; Heather I. Greenwood, MD; Jessica H. Hayward, MD; Michael D. Hope, MD; Priyanka Jha, MBBS; Bonnie N. Joe, MD, PhD; Kimberly G. Kallianos, MD; Amie Y. Lee, MD; Terry C.P. Lynch, MD; John D. MacKenzie, MD; Tara A. Morgan, MD; Daria Motamedi, MD; David M. Naeger, MD; Michael A. Ohliger, MD, PhD; Rina Patel, MD; Andrew S. Phelps, MD ; Liina Poder, MD; Vinil N. Shah MD; Dorothy J. Shum, MD; Ramya Srinivasan, MD; Lori M. Strachowski, MD; Derek Sun, MD; Jason F. Talbott, MD, PhD; Alina Uzelac, DO; Javier Villanueva-Meyer, MD; Emily M. Webb, MD; Stefanie Weinstein, MD; Esther L. Yuh, MD, PhD; Matthew Zapala, MD, PhD.